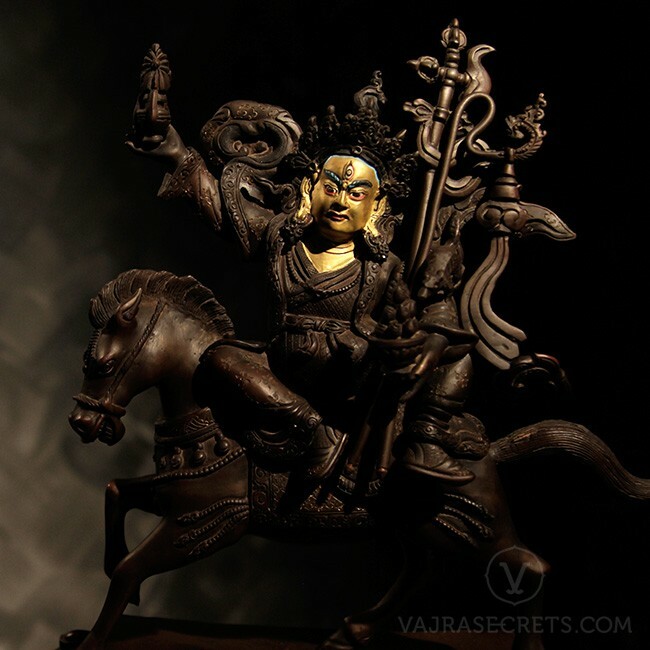 Invoke the abundant energies of Gyenze, the “increase” form of Dorje Shugden to usher in seen and unseen riches. This puja draws upon the powerful wealth attracting energies of Gyenze to swiftly resolve financial difficulties, increase lifespan, material resources, merit, spiritual realisations, and all that is good. Well-loved and revered by many, Gyenze is the "increase" form of Dorje Shugden who is swift in his ability to resolve financial difficulties, increase lifespan, and provide an abundance of material resources, merit, spiritual realisations, and all that is good. With a body that is rich yellow-gold in colour, Gyenze or Ratna Shugden holds a long life vase containing the branch of a wish-granting tree in his right hand, while his left carries a bowl filled with precious jewels, symbolic of his ability to bring us material resources and abundance in all aspects. Adorned with rich yellow robes, he rides a divine yellow palomino horse, symbolic of his ability to come to our aid swiftly. Gyenze's puja can help improve one’s financial situation, bring us inner wealth, and create the causes for us to be free from spiritual and material poverty. It is also recommended as an auspicious start for new business ventures and to boost the success of existing businesses.